This seminar teaches strategies essential to counseling and advocacy for frail elders, people with disabilities and their families. Participants learn client engagement, adjustment-to-loss, and family mediation counseling strategies. Ethical issues associated with conflict between family and client values, and client right to privacy and self-determination are explored. Or call us 1.413.637.1436, or email us at eldercare@earthlink.net for more information. This seminar is approved for CEUs for social workers, licensed mental health counselors, psychologists, and nurses in most states. Please check with us concerning your particular state by emailing your inquiry to eldercare@earthlink.net. 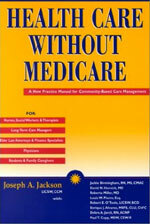 Joseph A. Jackson, LICSW, CCM offers this one-day workshop by invitation from health care organizations and professional groups across the country. He will adapt the seminar content and emphasis to meet your organization’s needs. He can be contacted at eldercare@earthlink.net and will be happy to forward a workshop contract to you.